In the altered reality of the Deathlands, America's coastal waters haven't escaped the ravages of the nukecaust, but the awesome power of the oceans still rules here. It's a power that will let Ryan Cawdor, first among postholocaust survivors, ride the crest of victory--or consign his woman to the raging depths. Emerging from a gateway on the ruins of the Georgia coastline, Ryan Cawdor and his warrior survivalists embark on a voyage up the Atlantic coast. But treachery awaits as they're beset by pirates, then a violent storm that pulls Krysty Wroth and Jak Lauren beneath the waves. 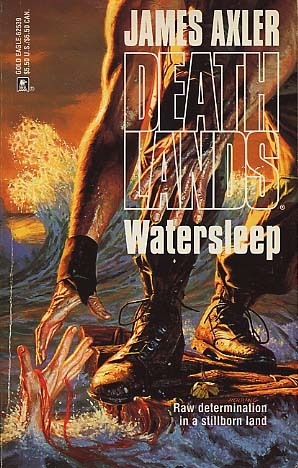 Now Ryan must contend with a self-proclaimed lord of the sea as he struggles to reclaim what's his from a watery grave.